Businesses typically use a “bottoms up” or judgement based forecasting process. This process starts with numbers that individual sales reps commit to based on their judgement. These numbers are then rolled up through the management hierarchy with each manager adjusting numbers based on their own judgement. Sales organizations either use modern tools (like Collaborative Forecasting available in Salesforce) or simply rely on complex spreadsheets. Some companies also invest in custom tools that are tailored to meet their specific needs. SpringML’s forecasting algorithm on the other hand provides an unbiased, data driven forecast using Machine Learning. Our models consume both historical data to gauge trends and seasonality as well as current pipeline of opportunities to then forecast sales for the next 6 or 12 months. This model runs automatically and presents a monthly or quarterly forecast constantly learning on new data provided. Show image of forecasting screenomplex process involved with Forecasting, given each organization’s business model is unique. We understand that sales organizations may be comfortable with using their existing judgement based forecasting tool. Our predictive solution is not aimed at replacing judgment but to it. 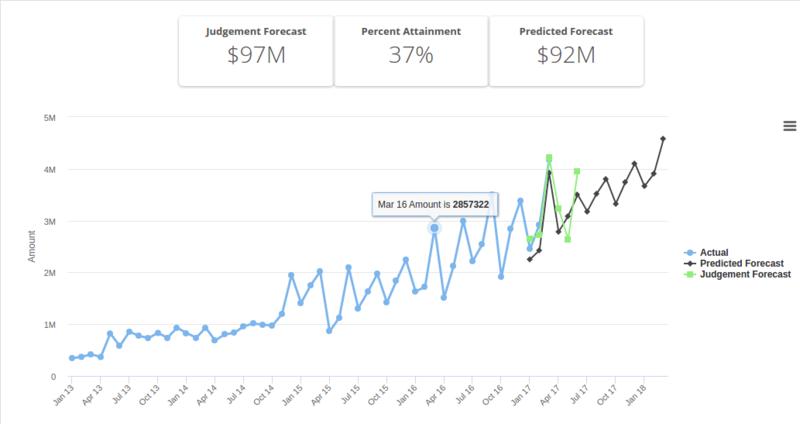 We bring together both predictive and judgement forecasts into a single screen so that sales management has access to both the numbers and can make informed decisions.